Let me start off by saying that the OMM (original Middle Manager™) is a carnivore. I eat meat. With that little tidbit out of the way, I will submit that Yves Meatless Chili is my first ever "meatless" (aka vegetarian, in fact, vegan) dish, but it will not be my last! Being a meat eater my expectations were set very low, and Yves Meatless Chili surprised me on many fronts. The portion size was about what I expected it to be, adequate. As is typical, I would have preferred a slightly larger portion. However as Middle Managers™ are well aware, if you want to burn fat or experience weight loss, keeping the portion size reasonable is a key component. Preparation was easy enough, 2 minutes and 30 seconds in the good ol' microwave. The smell coming from the microwave was excellent! After giving it a few minutes to cool off, and removing the clear cellophane from the top of the "processed food black" bowl (someone please tell me why these foods are in a black tray or bowl, I am sure there is a reason, I just don't know what it is), I was again pleased with the appearance. It was chunky and filled with kidney beans, tomatoes and red and green peppers. I thought the taste was good, but just a tad on the bland side. I must qualify that, however, by saying the am particularly fond of spice (especially the hot ones). That means that my bland may not be everyone's bland. The best compliment I can give is to simply say had I not known that I was eating vegetarian chili, then I would not have known the difference. I treated as I would treat probably any chili, by adding a touch of salt and and some Frank's Red Hot Sauce for spice and heat. From a nutritional standpoint, the chili does not disappoint. It hits many of the high points for people looking to burn fat and build muscle. I bowl (300 grams or 10.5 ounces) contains 240 calories. It packs 21 grams of protein, primarily from soy. Protein is a must for both those looking to build muscle and those looking to lose weight by burning fat. The 14 grams of fiber (37 total carbohydrates) will help you to feel full faster and longer as well. It contains only 1 gram of fat, with none of that coming from trans or saturated fats. The chili was not good enough to make me give up meat (by my own admission, it will take quite a bit to make that happen), but I will buy Yves Meatless Chili again. It is a good "quick and easy" chili that becomes excellent with some small tweaks (salt and Frank's). I would recommend it to the vegetarian community (especially those looking to build muscle due to the high protein content), and ANYONE looking for a tasty chili that is low in calories or who is following a low fat diet program. For those using a low carbohydrate approach to burning fat and weight loss, there is a moderate amount of carbohydrates, so keep that in mind as you consider your allowable carbohydrates for the day. 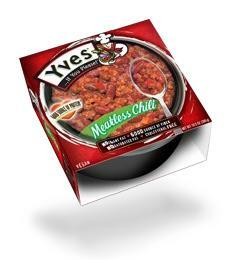 Yves Meatless Chili is a good and healthy diet for the people who do workout and want make healthy muscles. Infect, People who have overweight issues like to eat that diet because this help to burn fat. That is why everyone happy while eating that diet. However, I want to get content proofreading but i think website have good stuff related to workout. You said that you like to eat meat but Yves Meatless Chili that dish is meat less but the taste of that dish is like meat flavor. I don't taste this dish before read this post but after getting this post i must try it and i hope i will enjoy that dish. So, we can say that those people don't like to eat meat like Indian People(Hindu) they must try that dish. Actually, I'm finding custom essays uk but happy to find this post about new dish. If you're vegan.. just do it! Yves are life savers honestly. Get into it, and get the lasagna too. Thats my personal fav.